A few week's ago, I had the chance to try out the spring menu at Sullivan's Steakhouse in Chicago. Being a foodie, I was really excited for this event and I was not disappointed. I left entirely satisfied with a full belly plus I got to spend some time with great people. I teased some of the menu on Instagram but now you'll get to see the complete menu! If you're hungry, get ready for your stomach to growl like crazy. You're going to want to head straight to the fridge by the time you're through looking at these photos. The appetizers were a fantastic start to the night. Before we got a lesson from the sommelier, we got to taste both the Cheesesteak Eggroll (pictured below) and Tomato & Mozzarella Skewers. I think everyone who attended this event with me would agree that the eggroll was out of this world. Cheesy, savory and bursting with flavor, this is one of my favorites on their menu. I want to go back and order ten. The Tomato & Mozzarella Skewers are perfect for spring and summer. This light yet tasty option is drizzled with a basil pesto and aged balsamic vinegar. The flavors really complemented each other well. After a demo in the kitchen a lesson in mixology, we were greeted with giant plates of food. On one platter was three types of steak: Filet Mignon, Boneless Ribeye and Dry-Aged NY Strip Steak. Each were cooked to perfection. I couldn't tell which was which but there was one more on the medium-rare side (my favorite) that just melted in your mouth. The flavor was out of this world. I could have eaten a whole one. Prior to the meat, we were served the Pan Seared Sea Bass (pictured below) and Broiled Halibut. I'd never had sea bass prior to this meal but it's currently one of my favorite types of fish. There was a sweet glaze on it that I could have licked off the plate. It was flaky and tender, perfectly cooked. The halibut was accompanied with Lobster-Sweet Corn Salad & Citrus Vinaigrette. The halibut was also cooked really well. Tender, flaky and light in flavor. These would be great spring and summer dishes because they're not too heavy but still packed with flavor. There were four side dishes to accompany all of the entrees. I wasn't kidding when I said earlier that we left with full bellies. Halfway through the dinner, the lighting started to go down with the sun so my pictures aren't professional quality but these are some of the best. Hopefully they give you an idea but they definitely don't do some of these dishes justice. The Grilled Asparagus was cooked well. It wasn't cooked too long leaving it mushy but just enough so it still had a bite to it. I love that. The White Cheddar Au Gratin Potatoes with Bacon was a showstopper. Cheesy, tender and delicious, I could eat this for days. Can we just deliver a year's supply to my house please? The Three Cheese Mac (pictured below) was also a show stopper. I couldn't even handle all the cheesy goodness we were fed. I'm one of those people who could live happy with only mac n'cheese the rest of her life...just throw in a little meat too, ok? Last but not least, the Steakhouse Skillet Mushrooms. I wish I had the recipe to make these every single day. Whatever they were marinated in or cooked with was fantastic. Any savory craving I had before this meal was killed by this side. I loved that it was lighter too. The cheesy stuff is amazing but sometimes you want to lighten up, especially in the heat and these are perfect for just that. My sweet tooth is nothing to write home about but I appreciate really good treats, especially cheesecake. There were three for us to dig into. 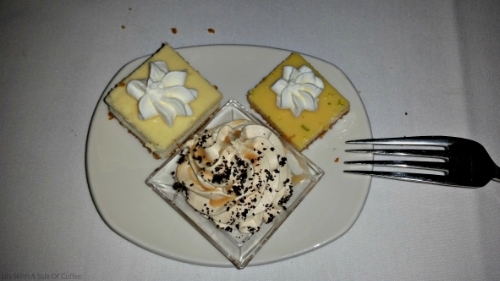 NY Style Cheesecake, Key Lime Pie and Peanut Butter Mousse. They almost had to roll me out of there. The cheesecake was light and creamy, exactly how I like my cheesecake. The Key Lime Pie was a first-time for me. I've only had the Yoplait Yogurt flavor. It was tangy and light and the graham cracker crust was to die for. The Peanut Butter Mousse was incredible and potentially my favorite. It was so light and so packed with flavor. It would dissolve in your mouth almost instantly but the flavor lingered. Before I let you go, probably to attack the fridge, I have the star of the spring menu: the Summer Rose. The Summer Rose is a light and fruity cocktail perfect for after work, dinner, dating or just a night out. Made with New Amsterdam Gin, Combier Rose Liqueur, White Cranberry Juice and Fresh Lime Juice, this is a drink for someone who likes the sweeter things in life. I personally love sweeter cocktails so this is right up my alley but don't be intimidated by that. The use of white cranberry juice really balances out the flavors. It's sweet but not overly sweet because it cuts through with a tartness you don't really expect. My favorite part is the presentation. It's such a pretty drink and I love the use of rose petals. It's a beautiful touch, perfect for the blooming season. So what do you think? Will you be heading to Sullivan's at some point for dinner? Visit Life With A Side Of Coffee on Facebook for more photos fro Sullivan's Steakhouse!